Many members of HUMMER OWNERS CLUB use MEKKING and SABITORIKING. Thank you so much. A　person from a dealer told me that my car looks different. I said to him that’s because I applied MEKKING! I’m impressed with its effect on my brand new car. It looks amazing. The best chemical for metal plating is definitely the one from NAKARAI. I use the accessory cleaning cloths as well! I’d been only using WAKO’s and SurLuster, but I’ll start using your products also! ■It helps to get rid of dirt. ■I can remove dirt by wiping the surface!! I got a free sample of MEKKING when I bought SABITORIKING and purchased the product on Amazon. My car, DS1100 looks so shiny now. I wish I had known about the product a lot earlier. Thank you. I won SABITORIKING and MEKKING as prizes and tried them. I normally give a quick wipe on my bike after I go for a ride. When I can’t get rid of dirt, I spray Parts Cleaner on a rag and wipe off the surface lightly. It takes less than ten minutes, but I haven’t been experiencing any noticeable marks. However, the plated part on the mirror is getting dull due to sand dust and dirt. Before I started using SABITORIKING, I had been using a rust remover in a tube. It seemed similar to SABITORIKING, but SABITORIKING is a lot finer. I can wipe off the surface with a cloth that is soaked in MEKKING after wiping off the powder from SABITORIKING. MEKKING is volatile, so it gets dry quickly. It looks really glossy before the metal plating gets dry, but it goes back to the normal state after that. I might get a little disappointed, but MEKKING is not metal plating solvent, but a metal plating protectant. We don’t want you to get confused by it. But, the best characteristic of the product shows after its application. I went on a bike ride to the foot of Tsukuba mountain after a few days of MEKKING application. Normally some dust gets stuck on the surface of metal plating parts. (Maybe it is due to static electricity?) However, after the application of MEKKING, the new layer blocks most of the dust from the surface of the metal plating parts. Regular application might help to clean my bike. Lastly, it might seem like a big job, if you try to finish all the application in one time. But, it’s actually a good idea to do a little bit of cleaning more frequently. The parts that show dirt noticeably should be protected by a layer of MEKKING. ▼I can use the product on my bicycle. It has removed the rust on the handles. First, I just want to let you know that I’m not hired by NAKARAI or a relative of the employers. The video clip I made is simply to help people who have issues with rust. I have never used other rust removers, so I have no idea where SABITORIKING sits in terms of its function, convenience and cost among other similar items. I personally thought the product is easy to use and actually works. The rust on my item has gone after giving it a gentle wipe. I didn’t scrub. It seems a bit pricy, but it works and you only need a little bit each time. So, it’s alright. This is my personal opinion though. I can’t be responsible for the content of the movie. I don’t know if NAKARAI reads this journal, but if you do and think my video sabotages your sales on the product, please contact me. http://youtu.be/dHU9hNoZXms I don’t know why, but I have trouble uploading pictures in sentences. “MEKKING is wonderful! My items don’t get rusty! A lot of people I know use it! I just came back from the beach, so maybe it doesn’t look as shiny.” We thought your vehicle looks dazzling. At Naps Yokohama. I’m going to use the product on various spots and upload the results on my blog. I found SABITORIKING when I was looking for some items that can get rid of the rust on the chrome plating of my second-hand bike. SABITOKING removed the rust on the fuel cap completely. I finished off with MEKKING, which adds a black glossy look on the plating. I highly recommend it. Before using the product, there were multiple rust spots. After use, most of the rust has gone. Even a little scrub could remove the rust on my bicycle. It’s a good feeling to see the rust disappear so easily. Please have a look at the result! Such luster☆☆☆The shabby rusty look has completely gone. *After the complete hardening, it gives off a natural shine of chrome plating. **If the rust is this bad, you can’t get rid of the rust so easily like you see in an ad of a girl in bikini, but it is significantly easier to clean compared to conventional abrasive cleansers. This is a great product. Dear Minkara friend, M. My bike (CB400SF) got a bit rusty. So, I tried putting it on! You can see the excellent result in the picture!! It looks beautiful even in the picture! You can finish off the process with MEKKING. When the original sparkle of the plating comes back, it looks amazing!! I was looking at a website of Harley. I happened to find MEKKING from NAKARAI. I was a bit suspicious when I purchased the best protectant of plating and a rust remover. They turned out to be amazing products. Your SABITORIKING is such a great item. I ride YAMAHA cruiser SC-32. As you can see, the handles were so rusty. It was due to sea water, so I’d given up on it. A friend of mine told me that SABITORIKING and MEKKING work well for seawater. I purchased them and they turned out to be great buy. I’m happy with the result. I look forward to my next cruise. I have purchased SABITORIKING and MEKKING. After polish, the dullness disappeared and it starts to give deep sparkle. *My handle name on Bikebros is izu-chan. Mine got selected in the top 10. MEKKING has a good reputation among its users. The user happily told us about the effect of MEKKING. Conventional plating cleansers can get rid of the dullness, but the effect only lasts for around 2 weeks. But after the application of MEKKING, the user hasn’t seen any hint of rust for 8 months. Mr. Kato liked a particular look. He wanted to keep the original state of the plating. I had a look at some parts that he applied MEKKING to. The corrosion of chromate parts, brass parts and aluminum parts seemed to have completely stopped. Amazing MEKKING! If you would like to keep the state of original classic look on your old cars, MEKKING is the way to go. My bike looks as though it was brand-new. The end of year cleaning wouldn’t be a hassle any more if you have this product. This time we cleared a boat-shaped bumper. You should get rid of the dirt you got this year before the year changes. I used SABITORIKING and MEKKING on CL125k that I bought 41 years ago. It looks relatively clean, but I suppose it was too late. I think I need to re-plate it. It is a lot shiner. I like it more now. MEKKING has a great value. The rough look on the front wheel turned out to be rust. Then I found a sample of SABITORIKING on the website of NAKARAI! I instantly ordered it and tried it on my car. After I washed the wheel and sucked up the water on the wheel, I took out SABITORIKING. Please King. I gave it a light scrub and wow! It looked so clean. I didn’t take pictures, but the King removed rust on persistent brake dust. It was just a sample, but I’m glad it got delivered quickly. I would like my car look beautiful like a lady with a help of SABITORIKING. Haha. Seriously, it is easier to see the result with a close shot of the picture. Bad rust crew. They dull the luster on my front wheel. Parts Cleaner can’t get rid of the rust at this stage. The king of rust removers. Please help. After applying SABITORIKING, I can get rid of rust easily. The rough looking surface becomes smooth. This is how peace comes back to spoke tire kingdom. It got rid of rust more than I had expected. There aren’t any pictures, but the dirt on the front wheel spoke has been removed by the sample. If you have a problem of cleaning spokes, you might want to test the sample. 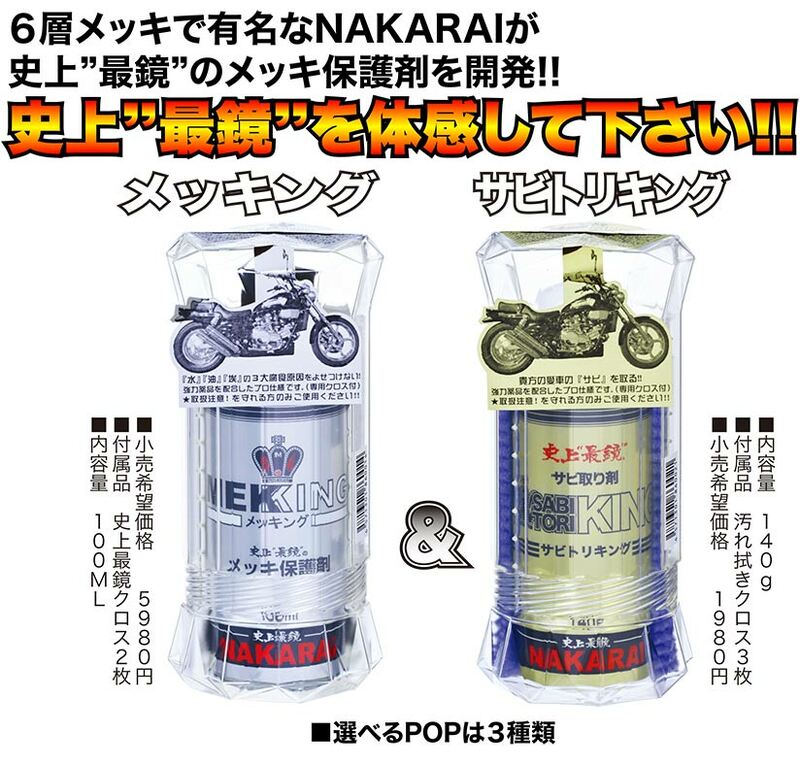 NAKARAI, how about you launch a new product called “Spoking” that comes with spoke cleaning products? Mio from Ibaraki I bought a set of MEKKING and SABITORIKING at NAKARAI booth in Blue Sky Heaven event a year ago. My friends used to say, “Your spoke looks so brown. It might get broken soon”. That brown spoke came back from the dead with MEKKING and SABITORIKING. You don’t need any strength to use SABITORIKING! It’s so easy to remove rust! The people who watched me use the product were amazed at the effect of MEKKING!! After that, I use a little bit of MEKKING about once every two months to maintain the sparkle. It only needs a little each time, so it lasts so long! The company might not be able to make much money if the product lasts for a long time. …He is even concerned about our business. Also the friends who said, “Your spoke looks so brown. It might get broken soon”. They have purchased a set of MEKKING and SABITORIKING. I bought a set of MEKKING and SABITORIKING. MEKKING is easy to spread on a large area! My item is sparkling after application!! It hasn’t really been looking dull. It feels so nice and smooth. It blocks off dirt! The deep down spots seemed to be hard to get rid of. We recommend using both SABITORIKING and normal parts cleaner. It helps SABITORIKING to seek through the deeper rust! That is a little trick that works. We hope it worked for him. It took a while to apply MEKKING. But the result is excellent!! By applying it once a year, it doesn’t get rusty at all! The product lasts so long since you only need a little to apply! It’s great to know that “it doesn’t get rusty if you apply it once a year”. I bought a set of MEKKING and SABITORIING. You only need to be cautious when you first apply them on your item. After that, you only need to use the product on particular spots. I apply the product on a regular basis, but I still have half left! 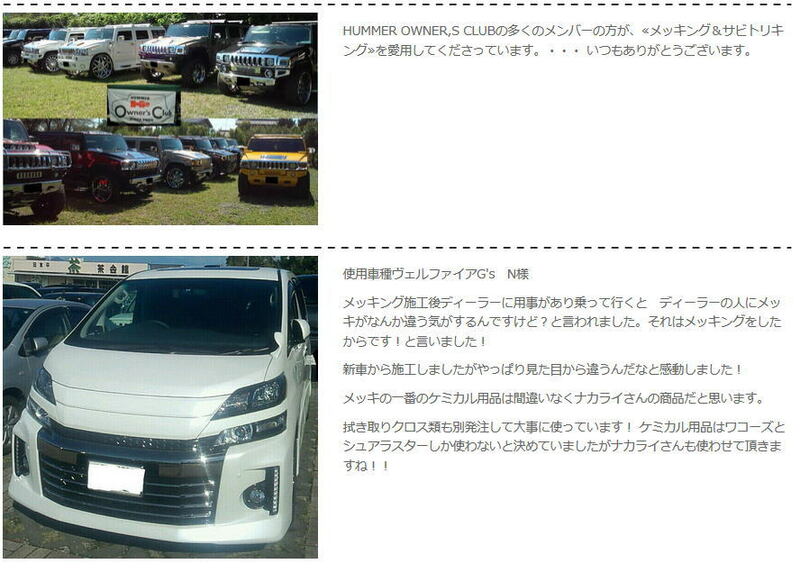 The products are sold at YANASE AUTO in Gunma prefecture. Please come and have a look. On the weekend I removed the rust on my car with my son. We live in Noboribetsu area, where cars tend to get rust due to sulfur from the hot springs. Rust appears especially on metal plating parts. I was looking for rust removers online. That was when I found SABITORIKING and MEKKING from NAKARAI! According to the manual steps, the key seems to be to put a lot of SABITORIKING on the accessory cloth! When applying the product on rust, I gave a gentle polish in a circle motion. The rust was getting thinner and thinner. A hard scrub can damage the surface, so I was being really careful. After wiping it off with a dry cloth, it looked so beautiful! I put a couple drops of MEKKING on the Sparkling cleaning cloth and applied it thinly. It took about a day to harden the coating. It was severe rust, so I had almost given up on it. I’m pretty happy with the result. The set price of SABITORIKING and MEKKING is 7,980 yen. It seems a little pricy for me, but I got my money’s worth. When I was polishing my Harley the other day, I found spotty rust on the wheel! 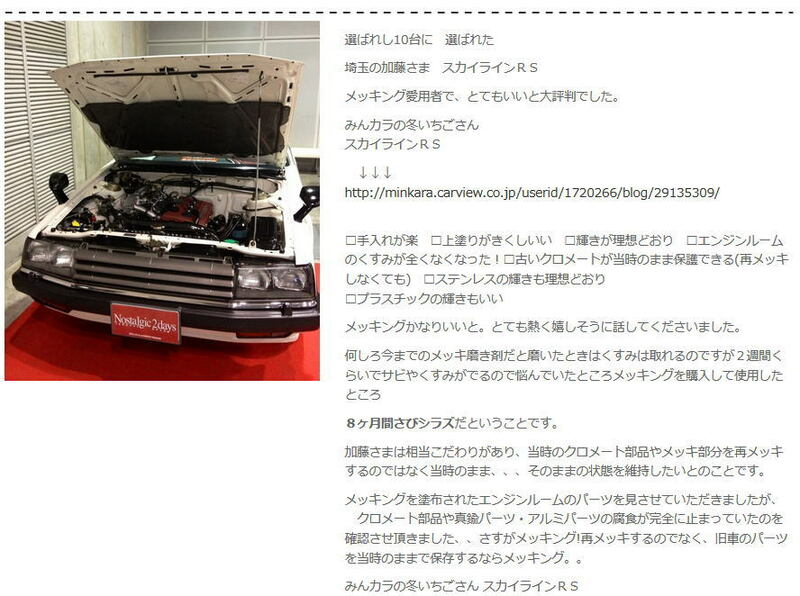 I researched rust removal on the internet and found SABITORIKING and MEKKING at NAKARAI. The effect took me by surprise. It removed all the spotty rust like you can see on the picture. The parts where I applied MEKKING look shiny! I highly recommend the product to everyone. It seriously cleaned my bike! I would like to use it on my other items. I polished my rusty blinker ASSY with SABITORIKING. It is shiny now. Holts was better at removing rust, but the finishing was excellent! I coated the surface with MEKKING! It added more sparkle. MEKKING has a great effect! It especially works well on protection for plastic plating. When I inquired last time, I got advice that the product works on plastic plating. But, it didn’t mean very much to me. But, when I actually used it on my plastic plating. It worked wonders. I own several bikes and I’ve noticed there are quite a lot of plastic plated parts. They are quite tricky. If you scrub too hard, the surface get peeled off and the base comes out, but if you don’t take care of them, they get rusty. It’s a headache for bike owners. When you put MEKKING on top of the surface, the plastic plating shines as if it were chrome plating. It doesn’t require much maintenance, so it sounds too good to believe. I’ve been recommending MEKKING to my friends. I hope the product becomes popular. MEKKING comes especially in handy for bike owners. Motorbikes are prone to get rusty, exposed to rain and wind. Also the quality of plastic plating is bad, so it’s quick to deteriorate. Plastic plating is used heavily on the body of cars and front grilles, but I’ve never heard any story of the plating on cars getting rubbed raw. On the other hand, plastic plating on bikes tend to get rusty and to peel off easily. You can extend the lifespan of your car substantially if you apply MEKKING on your brand new bike. Many people buy a new bike because their previous one gets too rusty. The amount of the product is way too much for bikes. I’ve heard that you can use the product on 30 bikes, but my experience tells me you can easily apply the product thinly several times on 100 bikes. MEKKING is a must for bikes, but the plating parts of bikes are only little. The product might become popular among bike owners if there is a small version of the product for a more reasonable price. Luckily, I have a lot of items that use metal plating such as lightening equipment and furniture. I polish them nicely to use up MEKKING. I wish I had applied MEKKING when I first bought those items. I bought the product yesterday, but… it is incredible! Things such as Brembo wheels get so shiny. I used MEKKING on the metal plating wheel of my car. I put several drops on the accessory cloth, spread it out thinly and wiped if off. I believe you can maintain the luster with a regular protection of MEKKING. I can tell the power of MEKKING. People at a petrol station asked me how I polish my car. 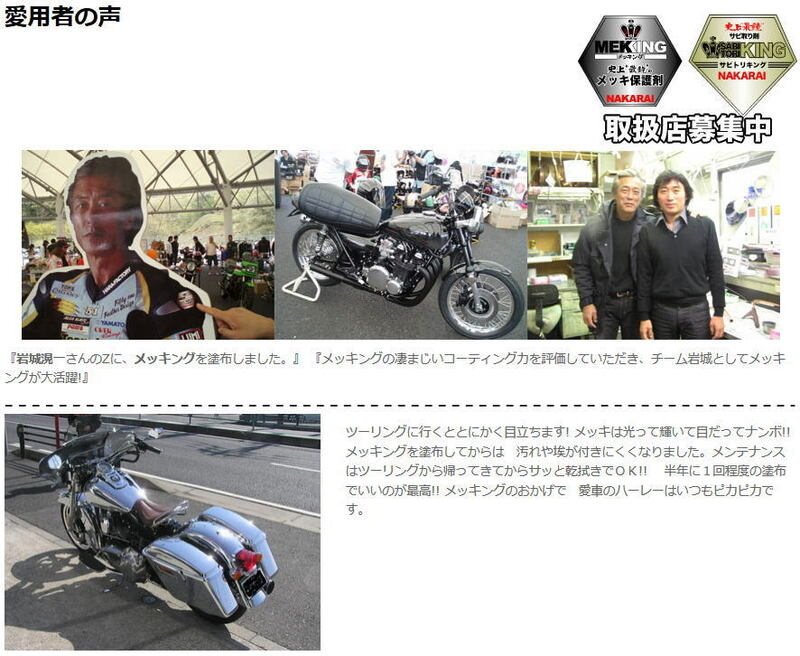 I would like to use the product on the metal plating of my Harley. It’s a 08FLHX street glide. I’ve been using MEKKING for 3 years. The luster and feeling of the surface is really good. I can tell the surface becomes smooth and shiny after its application. It makes me want to use it every time after I wash my car. It’s great for those who like to polish. The finishing look is evenly beautiful. I followed the manual, but I couldn’t remove the rust deeper than 0.1 mm. Is the rust too deep? Is there any way to get rid of the rust, using SABITORIKING? Oh god. It’s such a shame that it didn’t work much. →This is a reply to your question. “I could remove the rust on the surface. But, there is some black rust in deep. Black rust sometimes becomes white. Replating might be the only way for the persistent rust after this process. It can be concluded that the rust is too deep. ★We also provide replating service. I applied SABITORIKING and MEKKING on my American bike that I’ve been using for seven years. (purchased at KS Cartech). I look forward to see how the product works under an awful circumstance, such as falling ash from a volcano. We import metal plating parts from overseas and sell them in Japan. Since our company started applying MEKKING to our products before sending them off, we haven’t received any complaint of our plating. We have had several troubles regarding plating, but now it’s all solved. I put it on a white cloth and applied it on metal plating. The luster on metal plating is fantastic. My plating looked a little dull. But it is sparkling clean now! Nice to meet you, I’m N.
I would like to make a comment on the product use. I’ve been using the Sparkling cleaning cloth. To tell you the truth, I own several clear coating products. Among those, I especially like MEKKING. I can see the natural luster and transparent look. Also the surface looks properly coated. It looks so much better than my previous coating products. My first experience with its application was great. I would like to see what it can do for the next application of the product. I will let you know the result of the second application. I’d been getting specially ordered spectacles wiper from a dealer. That was quite a big favor. But, this cloth is made with a very fine fabric and better than any other clothes I have used. I’d love to keep on using this cloth. Mr. U. from Tottori prefecture. There has been a lot of hassle, trying to scrub off the dirt and rust of metal plating. A strange thing happened when I spread the product on the surface. The stubborn dirt was removed. It doesn’t scratch the plating because I didn’t put any pressure. I don’t know the result of its coating. It should become clear after it rain gets on the surface, but it hasn’t experienced any rain yet. But, the cloth that I used on applying became stiff in 24 hours. That means the coating solvent on the surface became hard also. The process that NAKARAI spoke of, the filling up the holes in plating must be talking about this process. I am experiencing the process that NAKARAI mentioned as the filling up of holes in the plating.. Both of them are excellent products. This is an incredible chemical! The spring on my solo seat hasn’t got any rust since I applied the product to the brand new part! The back of spring is easy to get rust, so the result was surprising. This is a great product for people would like to maintain their cars in a mint condition. I was truly amazed by it! I never attach any new custom parts without applying MEKKING first. They are both good buy! I ride a Drug Star Classic 400. There is one part that uses plating in DSC. It got rid of the rust. it showed the original metal plating shine. people who are into metal plating. The product lives up to its reputation. I would like to thank the plating studio. My machine used to have fine white spots, but SABITORIKING removed them all. Then, MEKKING added shine. My car looks new. It was truly surprising. Thank you so much. 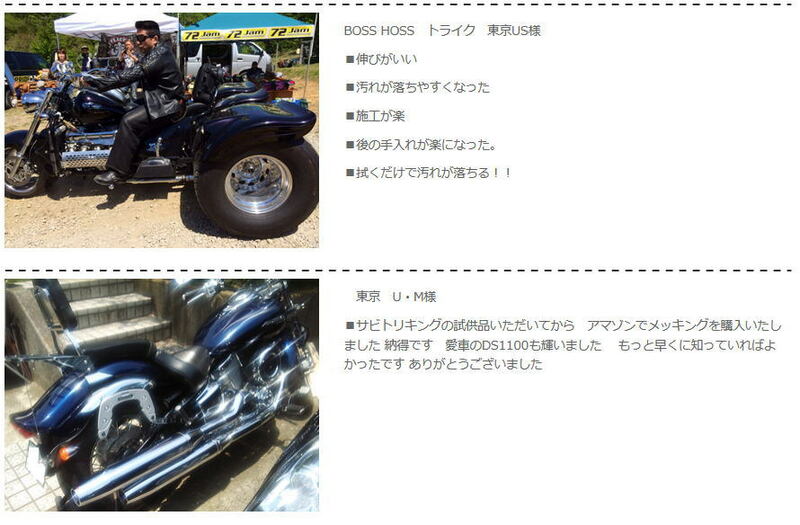 I bought the product at Club Harley. I just finished applying MEKKING, but the shine on the plating looks so much better! The plating looks glossier. Also it spreads so well that it seems to last for a long time. The product provides superior cost-effectiveness　I don’t know how long one bottle lasts. To tell you the truth, I thought it was quite expensive before I bought it, but it seems cheap now. SABITORIKING gets rid of all the small rusty spots. I highly recommend the set. If you like metal plating, this product is for you. NAKARAI is famous for plating work, so that’s why I bought it from them. SABITORIKING can remove rust without scrubbing hard. All you have to do is to stroke the surface several times with a special accompanying cloth. You don’t need much strength to do this, so the product is easy to use for ladies. MEKKING is also powerful. Even if you only use it once, you can tell the result on your plating. The product coats holes on the surface of plating, which makes the plating extra shiny. I’ve been using it for half a year or so. The plating has maintained its beautiful condition since I had applied it well on the first time. If it’s been clean like this for half a year. You might only need to apply MEKKING twice a year or so. The product was featured in the February issue of Baikichi. Bottom line is that I highly recommend both of the products. It’s surprisingly good. If you are someone who likes metal plating, you should give it a try. SABITORIKING is completely different from any of metal cleaning products that I’ve used so far. It doesn’t affect chrome plating, so I could remove rust without damaging the plating. It shows gorgeous luster. I only needed to overcoat several times at first. After that, you don’t have to apply the product for half a year. Spotty rust and corrosion have been annoying me for a long time, but MEKKING got rid of all the rust. Copyright cMekking All Rights Reserved.